Shape correction always is an active problem as the strength of the workpiece material increases. 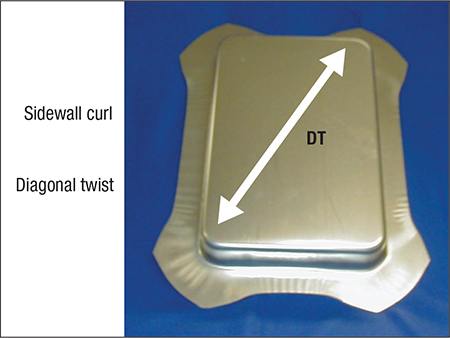 A channel, shell or other shape created by pulling the sheetmetal from the binder (Fig. 1) will have a gradient of positive to negative elastic stresses from one surface to the other. This causes springback-related sidewall curl. As the sheet forms around the corner of the tool, the outer surface stretches. 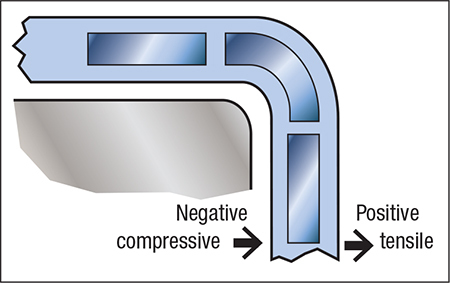 When released the outer-surface tensile stress pulls the material away from the tool; the reverse happens to the inner surface. Upon bending over the radius, the sheetmetal is compressed. When released, the inner material expands and the sheet pushes away from the tool. Both inner and outer surface stresses force the material to move in the same direction. Post-stretch is used to counteract this problem. This practice changes the positive-to-negative gradient to all-positive elastic stresses across the sheet thickness (Fig. 2). Release of the forming load only causes a reduction in sidewall length. The sidewall strain is increased 1 to 2 percent at the end of the stroke by locking the flange area with either a moveable bead, lock step, another die or some other method. This causes the neutral axis to move outside of the sheet. 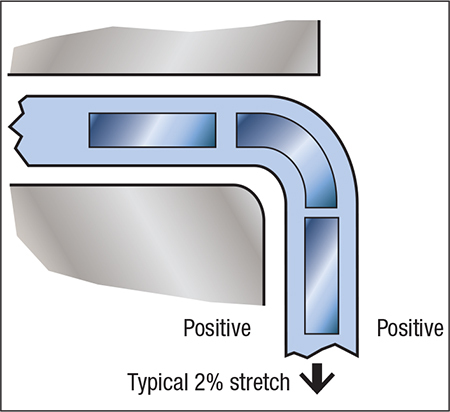 Further, stamping advanced high-strength steels may require lock beads to prevent sheetmetal flow into the sidewall during post-stretching. Fig. 3 shows a typical panel made without any post-stretch. When placed on a granite table, we can see that the sidewalls have turned away from vertical. The white arrow shows the direction of twist of the diagonal corners. When the lower left corner was held to the table, the diagonal corner had a gap measuring several inches. Another panel, stamped using the post-stretch process, exhibited straight sidewalls and no gaps between the table and the stamped part.